It is well known how the arrival of humans about 1,000 years ago drastically changed the ecosystem with the introduction of invasive plants and animals. It has led to stricter policies for releasing non native pets, increased regulations at trade ports and the emergence of restoration ecology, in which scientists strive to re-create a more native environment. But within areas seemingly overcome by invasive plants and animals, one Florida Museum of Natural History lepidopterist discovered three new native moth species. 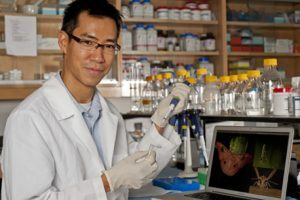 said Akito Kawahara, assistant curator of Lepidoptera at the Florida Museum, who led a study published in the February 2012 edition of ZooKeys. Kawahara described new species of an unusual genus commonly known as fancy case caterpillars. Similar to how snails carry a shell, the caterpillars wear different ornate “cases” throughout the larval stage of development. Hyposmocoma makawao from Makawao Forest Reserve in Maui and Hyposmocoma tantala from Mount Tantalus, Oahu. 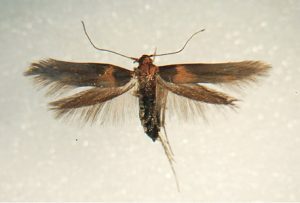 The genus Hyposmocoma includes about 350 described species and represents about 40 percent of all the moths and butterflies on the Hawaiian Islands. “It’s really important to focus conservation efforts in areas that are pristine and also to restore habitats that are disturbed,” Kawahara said. Hyposmocoma is also unique because many species within the genus are aquatic or carnivorous, which is uncommon in Lepidoptera. Aquatic species may be used as a means for assessing environmental habitat quality, such as the amount of pollution in streams. Scientists believe Hyposmocoma reached the Pacific islands millions of years ago, long before the colonization of humans. On an island chain where diverse songbirds, flightless rails and rare endemic plants once thrived, it is increasingly valuable for researchers to protect any remaining native biodiversity.